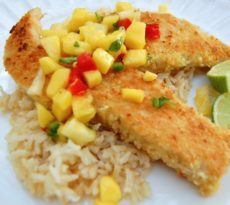 This one is for the angler that loves a good ol’ fish fry, buy also looking for a way to make it a little bit healthier. 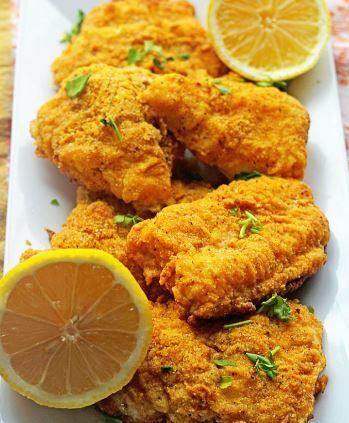 Introducing Spicy Oven Fried Catfish- No frying is necessary for it, and you won’t even miss it, trust me! 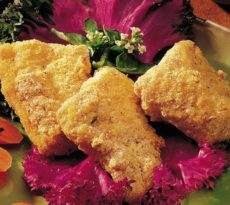 The flavor is perfectly spicy, the breading is crunchy, and the fish is flaky and moist yielding the most spectacular results. 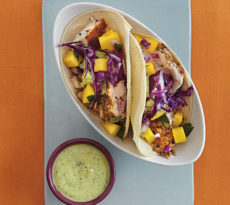 Thanks to cayenne, paprika, lemon pepper and a hint of hot sauce, you get all that Southern spice you crave without the guilt. Preheat oven to 425 degrees and line a baking sheet with parchment paper liberally sprayed with non-stick olive oil spray. Add each fillet to the bag of cornmeal breading to coat then dip into beaten eggs on both sides, then lastly add back into the cornmeal breading and shake liberally to coat well. Place the fillet on the coated baking sheet. Repeat with each fillet. Liberally spray the tops of each fillet with non-stick baking spray coating the fish well until completely covered in spray. Bake for 25-30 minutes depending on thickness of fillets until golden brown but still juicy in the inside. Remove fish and cool for 5 minutes then serve with lemon and chopped parsley.